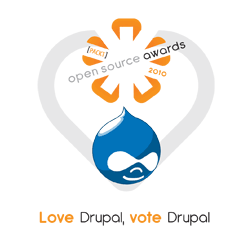 Support Drupal by voting in the 2010 Open Source Awards – All Markup News. Home » Drupal News » Support Drupal by voting in the 2010 Open Source Awards – All Markup News. Packt Publishing, the company behind many well-known Drupal books, is also responsible for the Open Source Awards, an annual online event held to distinguish excellence among open source projects. Winners of this competition receive cash awards that go to support their projects. Over the past five years, Drupal has won thousands of dollars in award competitions sponsored by Packt, due in no small part to the strength and passion of our community. This year, Drupal is up against historic rivals Joomla! and WordPress in the Hall of Fame CMS category. The winning project will receive $2,500. How can you help make Drupal win? Just go to Packt’s site and cast your vote. But don’t delay, as the competition is only open until November 5. Packt is also giving away a free Amazon Kindle to a randomly selected voter. Help support Drupal by voting today!